AutismWonderland: "I'm Mad at the Dirt"
"...your room looks like some two-dollar-a-week furnished room in some two-bit back street town in Oklahoma. Get up. Get up. Clean up this mess." I grew up in the kind of home where you could eat off the floor any day of the week. My mother worked hard to keep not only a neat home, but an immaculately clean home. No prints in the mirrors, wood furniture polished with Pledge, our rugs always streaked with fresh vacuum lines. And dinner always made by 6:30. She cleaned as she cooked -never burning a meal- and she never went to sleep with dishes in the sink. I don't think I can remember a day when she didn't clean. So I know that when she comes over every day to take care of The Boy, it drives her nuts looking around my apartment. But let's get this clear, I'm not dirty. Not gross, roach infested or anything like that. I'm messy and yes, there are times when the dust is so thick I could autograph my furniture. I only clean what needs to be cleaned: the kitchen & the bathroom. (And Norrin's room - his room is the best room in the joint.) Our clothes are always clean, though not always folded in there drawers. And the garbage always thrown out. But dusting, mopping? I can't keep up. I have three to four pairs of shoes out at at time (those are just my shoes). Piles of books laying around. Magazines - don't throw those away, I'm going to read them! And toys, toys, toys - in every single room. There just aren't enough hours in the day. And after I come home after a long day of work or school or The Boy's sensory gym - do I want to pick up a broom & mop? Not really. So I stick to the basics. And the weekend's go so quickly. There's laundry and food shopping and cooking. Or an appointment, an errand or a play date. Or I'm just so damn tired from working all week - do I want to clean? Do I have to? So this morning I forced myself to clean - dusted actually. Because staring at the thickness of it while on the computer makes me feel guilty. 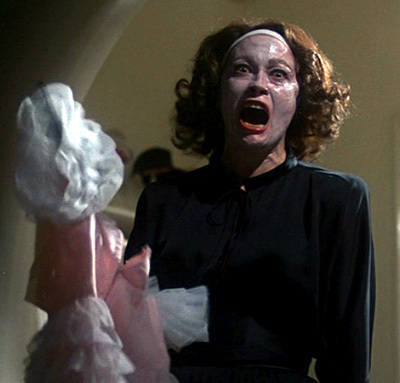 When I am in the moment, I clean with such vengeance Mommie Dearest would be proud. Scrubbing, scouring on my hands and knees, working up a sweat. My hands in scalding water, wringing out rags. Really cleaning, moving things out the way - not cleaning around the dirt and dust. And I feel like a better mom because of it. Dusting makes me feel like I've truly have everything under control. When finished, I sat back, admiring the shine of my furniture and stereo equipment, the gleam of my floor. Everything in its place. And then I heard the crash in The Boy's room. His high-pitched giggle. Barefoot, I stepped on a miniature army man walking to his room. His bin of legos dumped out on the floor. Every book from his book shelf pulled out. His bowl of cereal also on the floor, crushed crumbled flakes all over. His train set out. His sheets rumpled. He smiled. "It's a messy room! 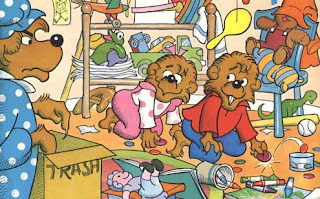 The Berenstain Bears and the Messy Room. 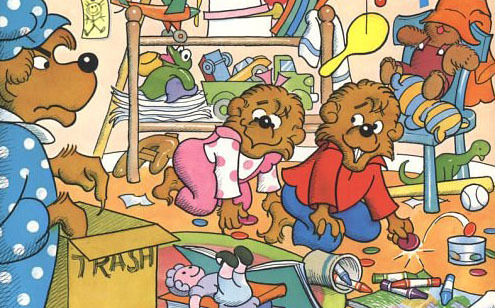 By Stan and Jan Berenstain." It's his favorite book of the month. And then I remember the real reason I resist cleaning. Sounds familiar! The husband wondered how the boy got into a few things today (corn meal, salt, sugar, pepper, rug cleaner, the list goes on) and I answered, "I had the audacity to cook something HOMEMADE." Yeah, it's survival mode around here most of the time. Anything extra is just gravy. I understand totally by the end of the week I'm exhausted from commuting work etc the last thing I want to do is cook when I get home or clean on the weekends, etc. and forget laundry I got tired of the crowds, try doing it with a small infant in a stroller, we did drop off service once and have been doing it ever since one less thing to do too bad maid service is too expensive. Not enough hours in a day with today's fast paced schedule and long days at work. You get to it when you feel up to it lol whenever that is. That was before there were computers. lol We would probably have homes like our mothers if we spent less time on the computer. We would have no choice but to make sure everything is spotless, because we would be bored with nothing to do. That and the Mrs. Ward image is dieing. But, that doesn't make a lazy, our priorities are just a little diffferen. Lol. "No more wire hangers!" Mommy Dearest is crazy. I'm not sure why it was one of my favorite movies when I was a kid. I agree...different priorities now. Being a SAHM isn't an occupation itself anymore. All the SAHM I know either work from home or are trying to get a degree or have a part-time job, while unfortunately most men still have it engrained in their brains that women can handle ALL the housework, cooking, laundry, and kids w/out much help! I few up in a family where the houses were super limpia too. My grandmother cleaned every single day. I can't keep up either, but it sure feels good when I do. It sort of feels like honoring the DNA. And by the way, that book is a hit at my house too. I whip it out sometimes when I need to reinforce cooperation.